In order to reap maximum profit and benefits from crypto trading, we need fresh relevant information. The vast majority of crypto ratings and price predictions get outdated quickly, and getting hot-off-the-press information is a challenge. BuySellHodl, the new cryptocurrency app, provides live Bitcoin price predictions, ratings and rankings for users to keep tabs on crypto assets. 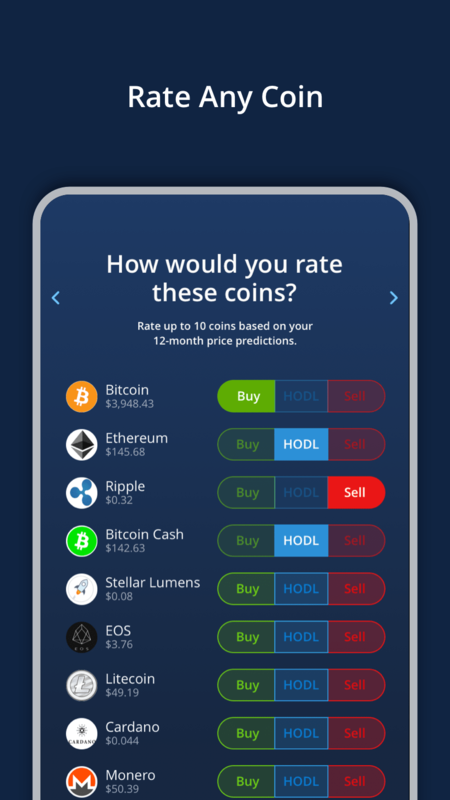 Offering crypto price predictions and ratings for top cryptocurrencies, it serves as a trading tool for both beginners and experts. The information can be accessed both via the BuySellHodlApp.com website, or iPhone and Android cryptocurrency apps. 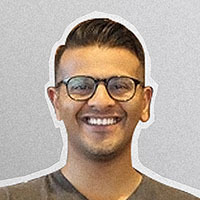 It has an innovative approach to price predictions providing live short-term and long-term forecasts, crypto ratings, and rankings. Price targets are updated hourly. Statistics about top coin picks. At the moment, BuySellHodl works with 18 cryptocurrencies. Crypto trading game for mastering trading skills for the vast majority of popular coins. Daily live Bitcoin game where you can win real cash. Rating trend for tracking users’ forecasts. How does the price prediction on BuySellHodl work? Where do they get relevant information? The website regularly organizes queries among users to provide readers with fresh, up-to-date price forecasts and rankings. Collected quantitative data is processed by the proprietary algorithm that generates metrics then. The calculations are made according to Lerner index by splitting a percentage of Hodl ratings evenly between the Buy and Sell and ratings, and then dividing those numbers. Live buy/sell/hodl user opinions are shown to express what they think about trading perspectives. This approach allows for making rankings unbiased and qualitative ratings that will help readers to evaluate trading possibilities, keep tabs on crypto market trends and make informed decisions to reap maximum profits. Each coin tab presents the freshest price prediction surveys, trends, and other relevant data. Aside from real-time price predictions, you can also check out the historical analysis for every coin. Trace the way crypto community changed its opinion, corrected ratings and sparked trends on the crypto market. You can clearly see market trends and what the majority thinks about cryptocurrencies, and which trading strategies they stick to. That helps to make a smart investment and reap maximum benefits from your investment fund. If you have a rich cryptocurrency portfolio and tend to alternate between investments, BuySellHodl will help you understand which cryptocurrency is more likely to provide you with profit, and what to buy in the nearest time. 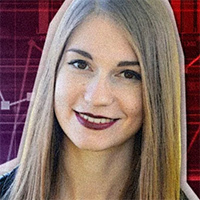 Aside from statistics and ratings, BuySellHodl has a news section where you can read about the latest Bitcoin price predictions and other altcoin price forecasts, market analysis, press releases and so on. The website helps users to stay in the know about what’s happening in the crypto industry, and what to expect from the market leaders. So, why registering in BuySellHodl is a must for traders? 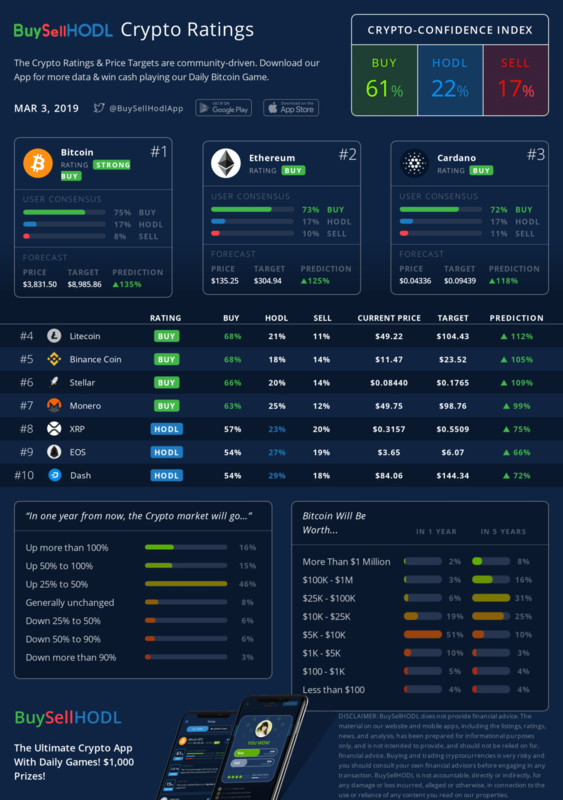 It provides real-time crypto price predictions, rankings, ratings, trends, and a lot of other useful information about the top cryptocurrencies and market overall. Live daily Bitcoin game allows winning money, not to mention it’s fun and helps you to boost your trading skills. Aside from basic information about cryptocurrencies provided on the coin tabs, you can also read crypto news, discover crypto market trends, and so much more. Clean, user-friendly interface and easy navigation make BuySellHodl perfect for both advanced traders and novices. A user is free to share their opinion and contribute to the formation of crypto market trends. On BuySellHodl, the majority decides on crypto coin ratings and predictions by casting votes. 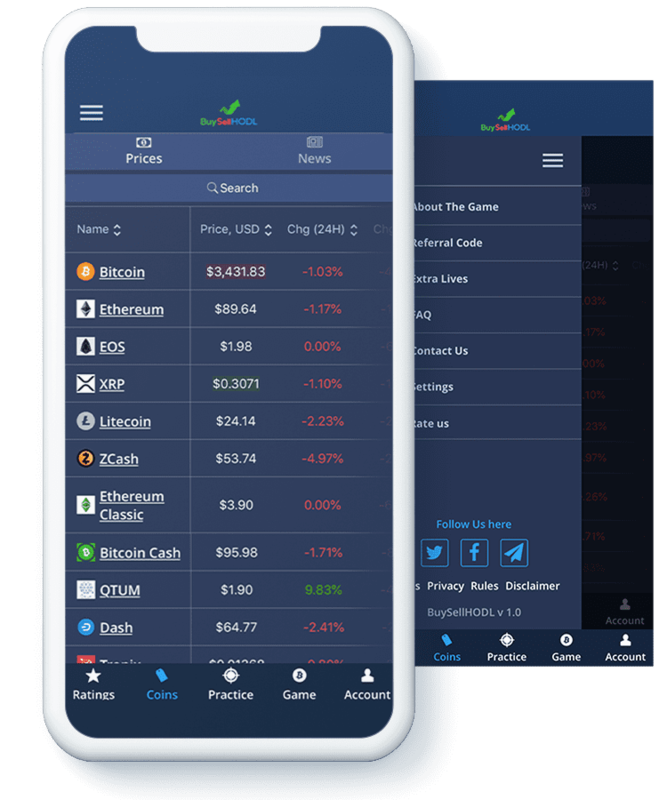 You can keep track on crypto price predictions on the go: BuySellHodl has a convenient iPhone and Android cryptocurrency app with the same functionality and intuitive UI. 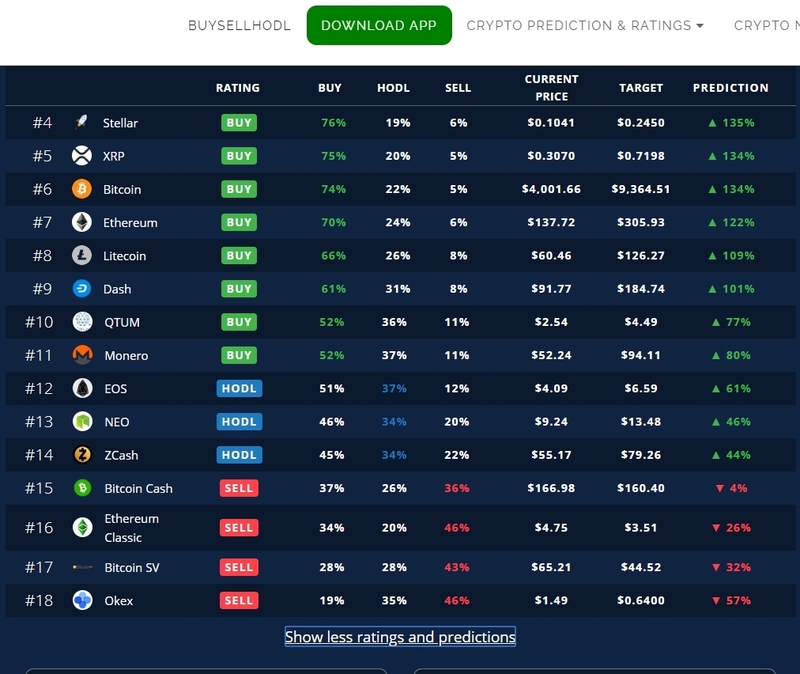 BuySellHodl is the only website with real-time user-generated crypto price predictions, long-term Bitcoin price forecasts, coin rankings, and ratings for cryptocurrencies and the overall market. It also gives an insight into historical data of coins’ values. Providing the new approach to crypto coin predictions, it gives users access to unbiased information and the possibility to participate in crypto market trend formation. Disclaimer: BuySellHodl is made to express the opinion of users. Published ratings/predictions/rankings are not investment advice – they are provided for informational purposes only. The data does not necessarily reflect the opinion of BuySellHodl. Every investment and trading involves risk, so you should always perform your own research prior to making decisions. We do not recommend investing money you cannot afford to lose.